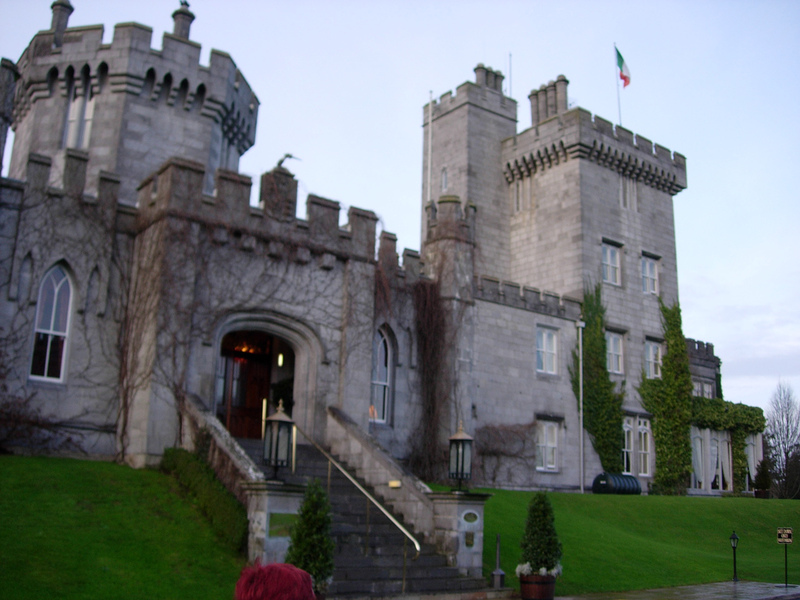 Dromoland Castle, near Shannon Airport, provides a princely welcome to Ireland. Motivated by the merriment of St. Patrick’s Day, and perhaps propelled by a pint or two of Guinness, you may find yourself eager to follow the advice of the Emerald Isle’s latest promotional slogan: “Jump into Ireland.” Landing at Shannon Airport, and lodging at Dromoland Castle Hotel and Country Estate, is the fastest way to get your feet wet in the deep end of Ireland’s picturesque pool of green fields, stone walls, and, nearby, its’ smashing seaside. Shannon, now accessible all year by air service direct from the United States, is in County Clare – in the west of Ireland on the opposite side of the republic from Dublin. Dublin has become international, commercial, and cosmopolitan. Clare, on the other hand, bordered by the River Shannon to the south and Galway Bay to the north, butts its barren Burren region against the Atlantic with its’ 700-foot Cliffs of Moher and remains the rural Ireland of visions and dreams. Every fantasy needs a castle, and only eight kilometers from Shannon Airport rises Dromoland, which, unlike many of the stirring royal ruins dotting the landscape, remains the kind of luxury fit for a king, which is exactly who occupied the now 5-star property in the 5th century. In terms of modern heads of state, President George W. Bush was among those who stayed at Dromoland in 2004. And while the comforts are modern, Dromoland’s feel is ageless. The only thing more stirring than taking in castle grounds and woodlands on horseback, dogs alongside, or fishing in its streams, is seeing other people do it just as it has been done on the property for centuries. The falconry, shooting and archery are also classic pursuits available in this Celtic enclave. Ireland’s oldest links golf course, the rugged, seaside Lahinch, is in the nearby holiday village of the same name, and is a perfect compliment to Dromoland’s beautiful parkland course. You can stroll on the strand of sand along the beach at Lahinch with a Dromoland-prepared champagne picnic basket. Return to the manor for afternoon tea and dine formally on locally sourced duck, roast rabbit saddle, oysters, Irish cheeses, smoked salmon and lamb. “The dining experience at Dromoland is second to none in Ireland,” says Brian Rooney, who grew up vacationing in Clare and is currently a director in Michigan’s Department of Health and Human Services. His uncle served as U.S. Ambassador to Ireland and his family has an ownership stake in Dromoland. Michigan-based travel writer Michael Patrick Shiels may be contacted at InviteYourself@aol.com or via www.TravelTattler.com His statewide morning show is heard weekday mornings in Lansing on 92.1 FM.